Stunning Primitive Rug Hooking Trunk Show on Display Now at the Shop! What is Primitive Rug Hooking? It's both an art and a craft in which strips of wool are pulled in loops through a sturdy woven foundation creating patterns and images used functionally and decoratively. As stated by Tracy Jamar, "The technique of pulling a loop of one fiber through a woven foundation has probably been done since the earliest manipulations of textiles..." but rug hooking as we know it has it's roots in the early 19th century here in North America with the useful creation of bed rugs and hearth rugs. You can learn more about the history of rug hooking at http://www.antiquequiltdating.com Today we make hooked rugs as a hobby or more deeply as an artful expression with a nod to more primitive times. Wool fabrics, both new and repurposed are felted and often hand-dyed and then cut into thin strips to be pulled through a linen backing. The textures are rich and interesting. Backing is first marked with a pattern and then stretched over a frame for hooking. Depending on the size of the strips and range of colors used, designs range from primitive to intricate. We are privileged to have a stunning Primitive Rug Hooking Trunk show on display here at the shop through next Saturday, September 1st with a variety of works from the Utah Rug and Fiber Guild. Our own wool expert, Marianne Michaels, is a member of this talented group! Pop into our classroom this week and see some inspiring works of art. 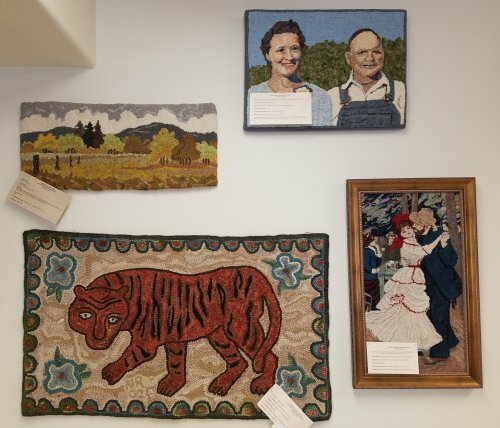 Chances are, you'll catch the rug hooking bug and want to learn more! Watch for Marianne's rug hooking class to appear on our Fall Class Schedule available early September. She will teach you about the basics including history, tools of the trade and beginning techniques. You'll have the chance to get started on your own work of hooked-rug art! Shown here are pieces hooked by Utah Rug and Fiber Guild members, Sharon Verdone (Logan, UT), Arline Keeling (Roy, UT), and Nancy Raybould (Salt Lake City, UT). NEW! 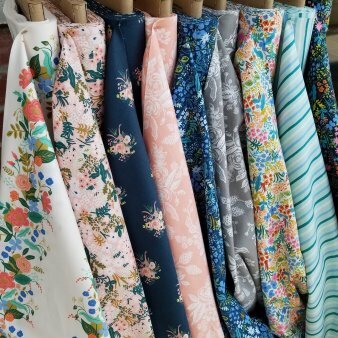 English Garden, the latest cotton prints by Rifle Paper Co. for Cotton + Steel are at the top of our current must have list. Now blooming at the shop and going fast! From Oh Scrap! by Lissa Alexander comes this happy stash buster quilt, Surrounded. 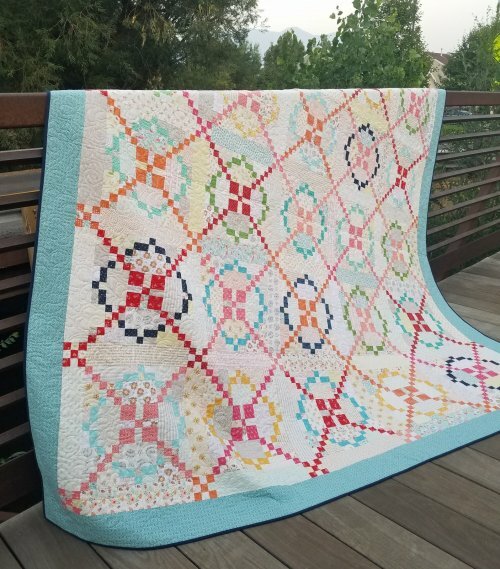 A variety of low volume scraps lend a gentle background to brightly colored bits pieced by Suzanne Adams and quilted by Ramona Sorensen. And just in case you want yours to look just like Suzanne's (we agree it IS pretty perfect) we have kits! August 27th - 25% off ONE CUT OF FABRIC! including all regular price cotton, minky & wool cut yardage! Friday, Sept 7th 10 a.m. - 11 p.m.
Saturday Sept 8th 10 a.m. - 7 p.m.